Chelsea are facing a vital few games as they look to get their season back on track, according to assistant boss Gianfranco Zola. Maurizio Sarri's side bounced back from last Sunday's 6-0 league defeat at Manchester City to beat Malmo in the Europa League on Thursday. Over the next month they play City and Malmo again, as well as Manchester United and Spurs. "It's very challenging - we know it's a crucial moment," said Zola. "I think the key will be to face each task by only thinking about that task." 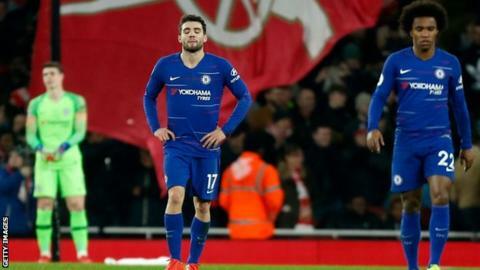 Fifteen points behind leaders Manchester City with 12 games remaining, Chelsea's more realistic chances of a trophy this season are in the FA Cup, Carabao Cup and Europa League. In a repeat of the 2018 final, Chelsea host Manchester United in the fifth round of the FA Cup on Monday (live on BBC One 19:30 GMT) before looking to build on a 2-1 first leg lead against Malmo in the last 32 of the Europa League. Sarri comes up against Manchester City again in the Carabao Cup final at Wembley on 24 February (16:30) before entertaining Tottenham three days later in the league (20:00). Sixth-placed Chelsea are one point and two places behind Ole Gunnar Solskjaer's United in the race for Champions League qualification. Speaking about Chelsea's tough run of fixtures, Zola said: "The first one is going to be United and we come into this game after a good performance in the Europa League. "It's a good challenge, it's actually what we need to do right now. "We know that we have to be consistent. We all know this. It's important everyone knows the situation and is working on it, players, coaches and club."